Do Minister Reynders and the Belgium government not yet realise this kind of thing is the kiss of death? Fortis used to be proud number 14 on the Fortune Global 500 list - a blurb also showing them on over 26 times leverage. At the last balance sheet date the asset base was €974bn against equity of €30bn, levered 32 times. "Talks about a takeover of Fortis by ING Groep NV and BNP Paribas SA stalled late yesterday amid demands for state guarantees, De Standaard reported on its Web site, without saying where it got the information. The Sunday Times reported the Belgian central bank and regulator are preparing to bail out Fortis. The newspaper didn't say where it got the information. " The €41.7bn Fortis structured credit portfolio has decreased €6.5bn since end-2007 and the bank reported that only €67m of this was subprime-related in the half (page 17 - huh?) with €4.6bn of the drop due to "repayments, final redemptions and exchange rates". "Scaldis is fully consolidated within Fortis and is a conduit that purchases eligible assets from investment grade, non-investment grade and unrated sellers. The asset pools contain continuous financing of third party clients’ assets such as consumer and auto loans, trade receivables, mortgages and lease receivables." 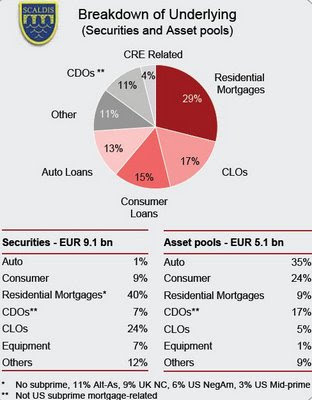 Without even going near the car loans and CLOs there is €4bn of residential mortgage exposure in there. It may not be subprime but it sure is not prime either. And it's only 20% of the total residential mortgage exposure in the €37.6bn credit spread portfolio - which according to Citi research enjoys an overall carrying value of 93%. Which they were: €380m versus €342m (page 7). Thank goodness they were right about that.